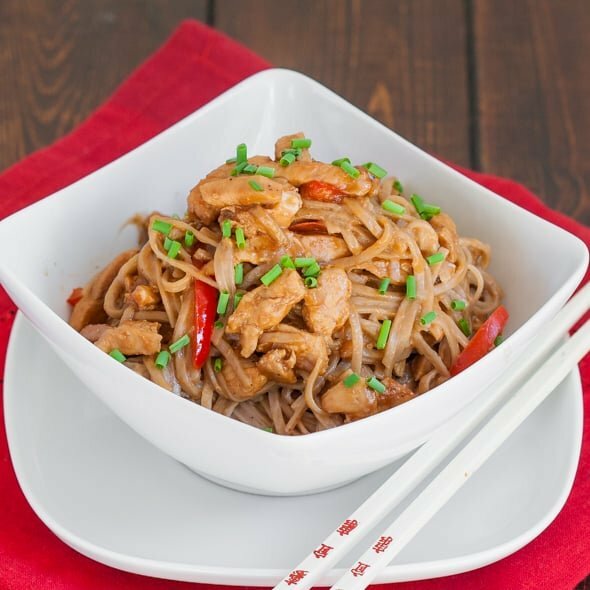 These spicy peanut and chicken soba noodles are amazing and a super simple dish that can be made in under 30 minutes. I am a soba noodles virgin! That’s right. In all my life, I have never had Soba Noodles. Of course, I couldn’t let this go on forever. So I bought some. First of all, I didn’t even know what soba noodles are. But as usual, I did my homework, and asked my good old friend, google. How did we ever live before google. Well anyway, this is what I learned. Soba is actually a Japanese word which means buckwheat. So Soba noodles are really just buckwheat noodles. I’ve been wanting to make a spicy peanut sauce for a long time so I finally decided to make it and thought it would go perfect with soba noodles. I don’t know if you love peanut sauce, but I adore it. I made this dish, and I didn’t really follow a recipe, just threw in some ingredients, but I have to tell you something. So listen carefully. These noodles are the best noodles I ever ate! I’ve never lied to you and I’ve never steered you wrong. When I tell you I love a recipe, I mean it. This is my all time favorite noodle recipe. There is so much flavor in this dish, I added Frank’s hot sauce to make it spicy, peanuty and a bit sweet from the peanut butter, oh and the chicken! Oh that chicken, I put bourbon on it, and soy sauce and honey, oh it was just delicious. Are you hungry yet, because my mouth is watering just writing about it. I don’t know if it was the soba noodles really soaking in those flavors or what, but I could not get enough of these noodles. I can’t wait to make them again. And because I love you all I’m going to share this wonderful concoction with you. In the meantime, in a large skillet heat sesame oil and add the chicken pieces to it. Cook chicken until no longer pink, then add garlic and ginger to it. Saute the garlic and ginger with the chicken for another 2 minutes and then add the red pepper, and saute an additional 2 minutes. Add bourbon, soy sauce, rice vinegar, honey, and hot sauce. In a small bowl, whisk the peanut butter with the water together and pour over the chicken. The sauce should thicken, add additional water if you want to make the sauce thinner. Season with salt and pepper if needed. Add soba noodles to skillet, remove from heat, and toss well to make sure all the noodles are coated with the sauce. I’m going to go more traditional and use a hot Chinese oil or a Sambal sauce. However this looks awesome and I can’t wait to try it. I am from Australia. Frank’s hot sauce????? what kind of sauce would you describe it as so I can try and get something similar. Do you thin Sriracha would work? Actually you can use your favorite hot sauce, even a sriracha would be nice in this recipe. My partner is allergic to peanuts. Would almond or sunflower seed butter serve as an equal substitute? You can try almond butter, that would be nice. This looks delicious! I am going to make this tonight and will let you know how it turns out. This recipe is awesome!!! Very yummy! And yes I substituted vanilla extractn (4tsp vanilla extract and 8 tsps of water, it was perfect! Glad you liked it Nina! hi, is there a substitute for bourbon that’s non alcoholic? In this recipe I would say to just skip it, but normally you could substitute vanilla extract. I love noodles and this looks wonderful!